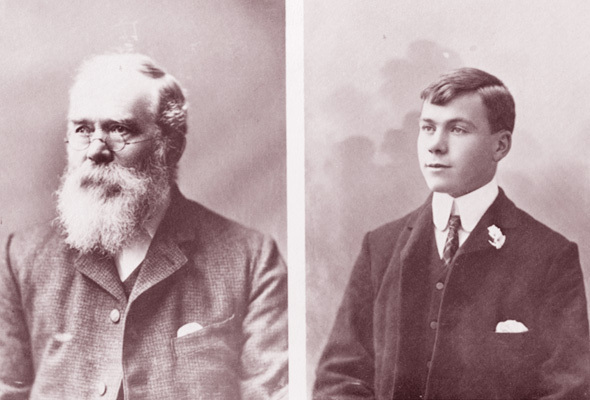 William Lambert, one of the town pioneers, on November 25th apprenticed his son Thomas, born May 27th 1882, to Thomas Riley, Joiner, to learn the trade. William had helped to build Springfield Hall at Pilling, Over-Wyre and he signed to the effect that his son would serve his master faithfully, keep his secrets, key his lawful commands, do no damage, nor waste nor lend his goods. For the first year Thomas received five shillings per week with one shilling rise per year so that in his sixth year of service he was earning ten shillings. Thomas Riley himself had been apprenticed this way and built up a highly successful firm in Fleetwood where he also had an ironmonger’s shop. He founded the North Lancashire Steam Sawmills and earned contracts for Fairhaven Lake and part of Blackpool sea wall. The cards above show William and Thomas Lambert, father and son. Thomas took so much care of his apprenticeship indenture it was still in good state of preservation on his 95th birthday.